Boyfriends Mum: "Do you like my new dress from Marks and Spencer's?" Me: "I do! I've seen some lovely things in there at the minute. Does that mean I'm getting old if I like things in M&S now?" Exit stage left with foot in mouth. This isn't just a blog post, this is an M&S themed blog post, inspired by a sudden turn of events. If I said I once bought a blouse and it was an isolated event I'd be lying. I actually have a handful of items gracing the rails of my wardrobe this very minute, the fact of which has left me a little blindsided. Blindsided and wondering, did M&S get better or did I just get older? It is not a sweeping generalisation to state that all Mums love Marks and Spencers. Show me a Mum who didn't attend a festive buffet circa 2010 wearing an embellished Per Una cardigan, and I'll give you 50 free sparks points. Whether it's a floaty top to cover up their swimwear or a shoe thats built for comfort, British Mums have been flocking to their local high street store since 1884, dragging unwitting children with them as they go. I firmly believe that the changing rooms in said store were kitted out with seating in each individual cubicle, solely so the children of the 80s and 90s had somewhere to rest their shopping weary legs while they begrudgingly dished out hangers and opinions to Mothers keen to know "How does this chenille roll neck look?" As a child however the clothes trying on was preferable to the food shopping. This could stem from having a Mum who can't be within 100 yards of an M&S without nipping to the food hall for "bits." As a direct result I've had more individual fruit trifles than I care to divulge on here and I can proudly say I once got lost in M&S. To cut a long story short I found my Mum again, down the next aisle, but lost and alone in the cheese section of an M&S, for the three minutes it lasted, was mentally scarring for a youngster. If I'm clingy when you're trying to choose your Stilton, that's why. It goes without saying then, that when you find yourself at 30 (+3) browsing the store voluntarily and making purchases of your own freewill, an adult life milestone has been reached. 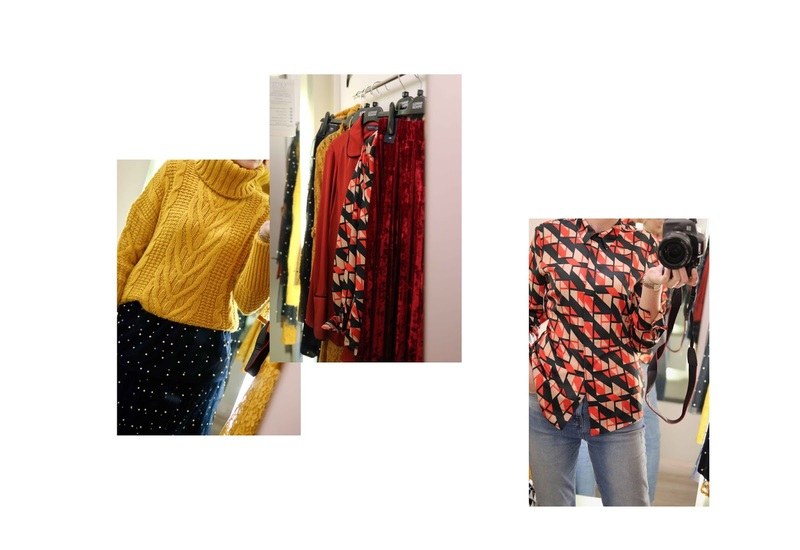 Just yesterday I was happily hauled away in my individual changing cubicle, with seating, trying on chunky mustard knits, red velvet midi skirts and dreamy satin shirts to kit myself out for Autumn. And all without a whiff of a Percy pig bribe. Sure being in my thirties may be playing it's part in my unexpected turn of shopping events but I also blame Alexa Chung. Alexa's Archive Collection launched in 2016 and had sold 20,000 pieces on day one. Fashionable pieces, with a nod to the retro styles of the M&S archives and all at affordable prices. Suddenly the high street store isn't just for ladies looking for a longer cardigan to keep the draft off their hips, nor is it just for children to sulk their way around. Consider the Marks and Sparks game upped. Although the Archive Collection isn't in the stores at the moment there's still so many nice finds in there. I'm telling you, it's cool to shop at M&S now and it has absolutely nothing to do with my age. Nice pieces and good quality too. Ugh, did I just use good quality as a selling point? Ok, so maybe age has a tiny bit to do with it. If I start blogging about pop socks call an intervention. (If you read my last post about not buying clothes for one month, I did very well until the last day. On the 30th September I shopped. Who would've thought M&S would be my downfall eh).